ROME/GENEVA, Mar 18 2017 (IPS) - Religious discrimination, fanaticism and xenophobia have worsened in several countries in Europe, Asia, Africa, the Middle East and North America, thus there is a need for alternatives to identify a common strategy to address these challenges, a Geneva-based think tank promoting global dialogue stated. William Lacy Swing, Director General of the International Organization for Migration (IOM) who participated in this meeting, entitled “Islam and Christianity, the Great Convergence: Working Jointly Towards Equal Citizenship Rights, highlighted the importance of recognising the convergences of the Abrahamic religions – Islam and Christianity – in order to overcome religious divisions. Prince Hassan bin Talal of Jordan underlined in a video message the importance of fostering religious tolerance and inter-faith harmony between Christians and Muslims as well as intra-faith cohesion. Referring to the Brussels Declaration entitled “The Peace of God in the World’ Towards Peaceful Coexistence and Collaboration Among the Three Monotheistic Religions: Judaism, Christianity, and Islam”, he underscored the importance of bringing peace to the world and the need for peaceful co-existence between religious groups. “All of our religions disapprove of religious justification of violence and inhumane actions, none of them approve of violence, terrorism or ill treatment of human beings,” he said. For his part, the Chairman of the Geneva Centre Dr. Hanif Hassan Ali Al Qassim highlighted the significance of garnering the support of Muslim and Christian leaders to restore relations between Islam and Christianity. “Today we have a tremendous opportunity to discuss the convergences between Islam and Christianity and to continue our joint efforts combining our strengths to promote equal citizenship rights,” he added. The Minister of State for Tolerance of the United Arab Emirates, Sheikha Lubna Khalid al Qasimi, for her part emphasised the need for Christian-Muslim dialogue as a necessary condition for peace, tolerance and harmony. 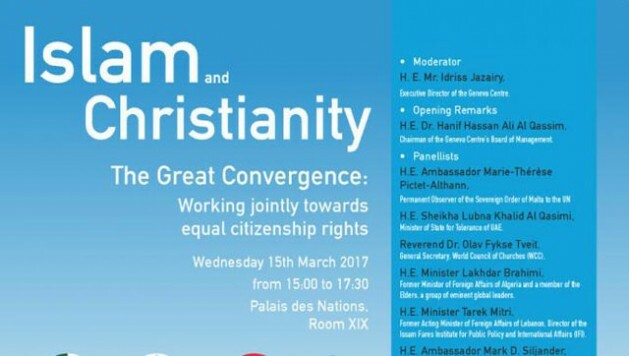 As part of the meeting’s agenda, the Executive Director of the Geneva Centre Idriss Jazairy presented a draft agenda for a forthcoming world conference entitled “Religions, Creeds or Other Value Systems and Equal Citizenship Rights” that will build on the discussions initiated during the meeting. The goal of this conference would be to initiate a structured dialogue that might lead to the obsolescence of the concept of minority and to its replacement by that of a model of inclusive and equal citizenship rights. On the conference, the Former Acting Foreign Minister of Lebanon and the current Director of the Issam Fares Institute for Public Policy and International Affairs in Beirut, Dr. Tarek Mitri, argued that states should be established on the principles of citizenship, equality and law to create an environment of plurality and tolerance. “Re-vitalising the pact of citizenship necessitates the rebuilding of state institutions on the foundation of the rule of law. The state’s chief obligation is to protect its citizens, all its citizens. Politics of inclusion in fractured societies are a condition for equal citizenship,” he said. The former US ambassador to the United Nations and former member of the US Congress, Dr. Mark D. Siljander, ascertained that the convergence and the commonalities between the Abrahamic faiths of Islam and Christianity could lead to equal and inclusive citizenship rights. Drawing on his long-time expertise as a diplomat and peacemaker. And Pakistan’s ambassador Tehmina Janjua reminded the participants that the concept of equal and inclusive citizenship should go beyond religious affiliation. The goal of the Geneva Centre’s initiative was to highlight the many convergences that exist between Islam and Christianity, to recognise the potential of a “great convergence” between both religions, and to mitigate and reverse the social polarisation between affiliates of these two religions and the resulting marginalisation of religious minorities, discrimination, xenophobia and violence.